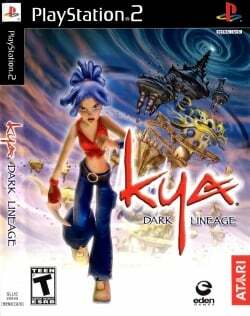 Game description: Plunged into a mysterious world, Kya must seek her way through multiple dangers to find her brother and a way back home. She discovers the Nativs, a peaceful tribe, oppressed by the Wolfens - the menacing army of the evil Brazul. Kya must lead the rebellion of the Nativs for their freedom. Mastering magical powers, Kya can liberate the Wolfens from their mystical imprisonment and restore their true Nativ identity. Steal your way through or fight head-to-head with hordes of Wolfens using original combat moves and magical strikes. Soar against various vertiginous wind currents on breathtaking flights. Slide down extreme entwined turbulent tracks, through challenging obstacles and lush environments. Journey through unbelievable acrobatic freefalls as you get closer to Kya's quest to save her brother and defeat the Fortress of Brazul. Alpha stencil hardware hack. Game works fine in Gsdx software mode. Gsdx hardware mode got some texture problems. Alpha stencil hack helps a lot except the fact that Shadows are still white in colour. Also videos flicker in hardware mode. Gsdx software mode got no problems. Playable. Bugs: Same bugs & fix as the US version: For rendering errors (stripes/garbage), use software mode or hardware hacks + the Skipdraw feature, For flickering videos, use software mode. Description: Blue patches appear on textures and sometimes partially block the view. Workaround: Go to Config > Video (GS) > Plugin Settings, set Renderer to "OpenGL (Hardware)", and make sure the "Disable Depth Emulation" hardware hack is not enabled. For older versions enable the Hardware Depth option. Alternatively for the Direct3D hardware renderers enable HW hacks, go to Advanced Settings and Hacks/Configure Hacks, and set Skipdraw to "3". This will remove the effect along with the character shadows. Or set Renderer to any of the "(Software)" options. Description: A blue fog appears slightly obscures the view. Workaround: Go to Config > Video (GS) > Plugin Settings, set Renderer to "OpenGL (Hardware)", and make sure Blending Unit Accuracy is set to at least the default "Basic". Alternatively for the Direct3D hardware renderers enable HW hacks, go to Advanced Settings and Hacks/Configure Hacks, and set Skipdraw to "3". This will remove the effect along with the character shadows. Or set Renderer to any of the "(Software)" options. Workaround: It can be brought to normal by moving somewhere else and bringing it up again. Description: The Atari logo flashes when loading the game, some other cutscenes flash too. Workaround: This has been fixes as of at least the PCSX2 stable version v1.0.0. For older versions go to Config > Emulation Settings > Gamefixes, turn on GameFixes and enable Switch to GSdx software rendering when an FMV plays, then start the game from Boot CD/DVD (full).